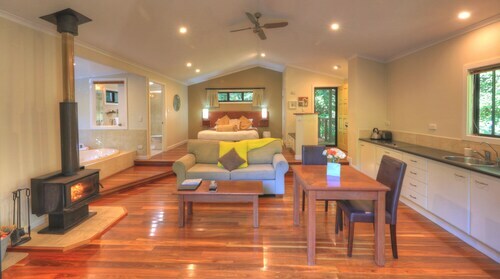 Stay in our Montville accommodation and enjoy this picturesque village in the Sunshine Coast hinterland. Montville is located on the Blackall Ranges, which were formed by ancient lava flows and are now a patchwork of dense rainforest and green pastures. Before European settlement the Aboriginal Kabi tribe used the area as a meeting place, where they gathered every two or three years to exchange stories, celebrate and to eat Bonyi Bonyi (the fruit of the Bunya Pine). The first settles came to the area in the 1880s and timber and dairy were the main industries. However, the farming of citrus, pineapples, macadamias and avocados soon dominated, as these crops were more suited to the climate. Relax and unwind, while staying in our Montville accommodation, by exploring the national parks and scenic walks of the area. Montville is around 430m above sea level and thus boasts great views over the Sunshine Coast and hinterland and a beautifully mild climate with an average of 7 hours of sunshine per day. Stay in our Montville accommodation and enjoy the old world charm of the area, as it is claimed that Montville is as close to an English Village as you will ever find in Australia. Montville also boasts home ware shops, clothes boutiques, woodwork and art galleries, cafes, fine dining and wineries. Our Montville accommodation is a great base from which to explore the Sunshine coast, with Maroochydore half an hour's drive, Mooloolaba and Caloundra 35 minutes' away and just a 40 minute drive to Noosa. While staying in our Montville accommodation explore the village and its numerous historic sites, including, the village green, the tiny timber churches, the original three-storey general store, which is now a restaurant, and the original school, which was the first public building in the village and is now part of the old teacher's residence on Razorback Lookout. Also, take the time to wander past some of the village's historic buildings which are now private residences. There are a number of homes which were once legendary guest houses during the 1920s when Montville was experiencing a tourist boom as a mountain holiday resort. Also worth a stroll-by is "Belbury", the home of one of the area's first settlers, Henry Smith. How Much is a Hotel Room in Montville? Hotels in Montville start at AU$120 per night. Prices and availability subject to change. Additional terms may apply.